Zak was born in 1951 in Johannesburg, South Africa. He studied architecture and building management, was a clerk in a municipal office, a stoker on the railways and a construction worker before finally deciding on a career as an artist. 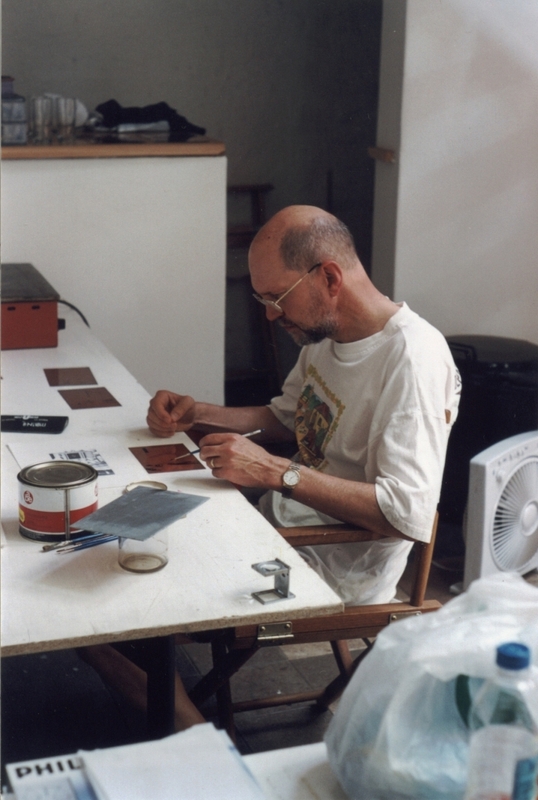 After completing a degree in Fine Arts in 1974, he lectured in printmaking, painted sets for the State Theatre, taught private art lessons and lectured at the Vaal University of Technology and Potschefstroom University. He has been making art full-time since about 1990. In 1996 he was diagnosed with Parkinson’s syndrome. He is married and lives in Vereeniging. 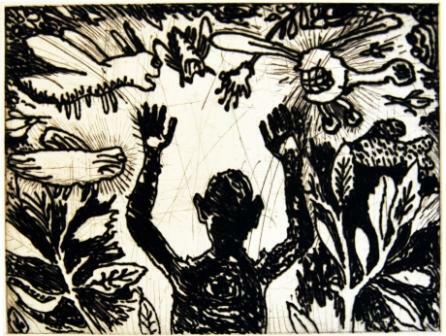 Surrender, drypoint etching,paper size: 338x392mm, image size: 19 5x265mm. With Job, Zak has learnt to say, “If we accept good from God, shall we not accept evil?” Job 2:10 New English Bible 1970. His condition caused his body to contract, so that, from time to time, he had to ask a helper to raise his arms and straighten him out. This etching is a moving self-portrait made after an operation to insert a deep brain stimulator enabling him to raise his arms by himself. Zak is a painter and a printmaker. He paints on board or on canvas in oil or acrylic. Lately he has worked on prints of his etchings enlarged onto canvas. He has also produced serigraphs and lithographs. Many of his works are enigmatic, dream-like images in which he juxtaposes unlikely objects. In others, he makes use of the everyday, or of historical reference. His works are layered with meaning, often humorous and child-like. He frequently achieves a kind of timelessness by using symmetrical compositions. His subject matter includes both social commentary and the intensely personal. Berge Blaas Blomme, 2008, oil on board, 700X900mm, framed. Life can look scary. Who knows what dangers lurk? But the ocean is not boundless, our life is circumscribed by God’s design. We may feel small and helpless, but “As the hills enfold Jerusalem, so the Lord enfolds his people, now and evermore.” Psalm 125:2, NEB. A home awaits us, sheltered in His loving, joyful presence. What does Zak want to achieve with his work? Zak Benjamin has always striven to make his work ‘recognizable’ by using images of things from contemporary life, or from shared memories. He wants his viewers to experience a moment of surprised recognition, as when coming across an old friend. He believes that interpreting a work of art is the part of the creative process that belongs to the viewer. His greatest current challenge is to produce any work at all, as his condition makes it very difficult for him to work regularly. 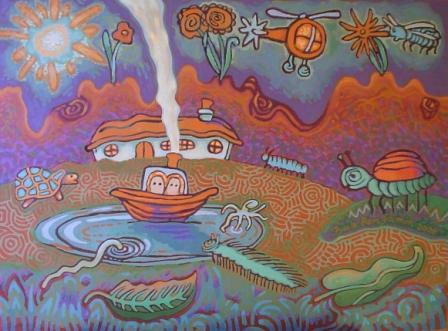 Lamp, 2007, acrylic on printed canvas, 740x990mm, unframed. A seemingly haphazard array of objects on the artist’s worktable presents us with clues. A flower blooms next to a ruler, a scraper, a hammer, a bottle of red wine, and . . . what looks like a rolled-up scroll. Although we do not know what is in store, the Architect and Builder of the universe is at work. Our job as Christians is to bloom. A friend suggested that Zak uses his series of still life etchings for paintings. They were enlarged and printed onto canvas, so that he could continue to produce work. Zak has been a committed Christian since 1987. Since that time he has been struggling with the question: What does Christian Art look like? His art can be read as a documentation of his life-journey. The early works show his search for meaning, and the later ones both the highs and lows of a walk by faith. - Foulds, Timothy John, Zak Benjamin – The influence of a Christian Worldview on Content. Dissertation, 1996, Vaal Triangle Technikon, Department of Fine Arts. - Schafer, Angelique Elizabeth, Origin and rebirth in the etchings of Zak Benjamin. Dissertation, 2003, Rhodes University, Department of Fine Arts. Supervisor G. Schoeman. 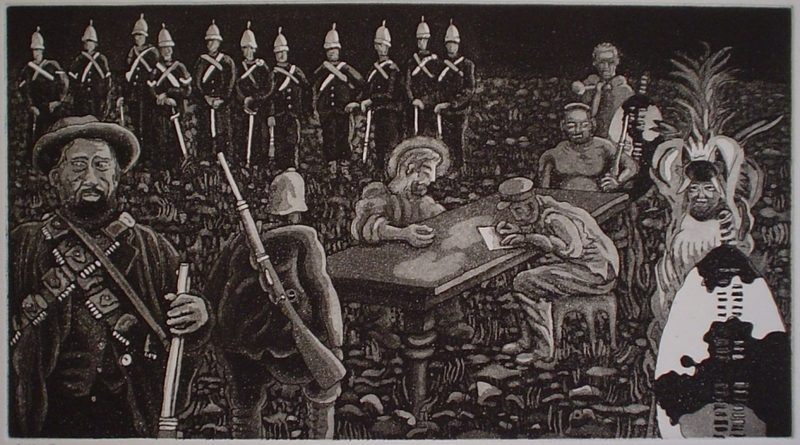 Declaration, 2005, etching, paper size 284x390mm, image size 156x286mm, unframed. Come, Lord Jesus! In South Africa, with its history of wars, the artist expresses a longing for the peace that only comes when every individual makes a commitment before Christ, and goes away with a new heart and mind.